The announced US tariff hike against cars would not only hurt car exporting countries, but many upstream producers as well. 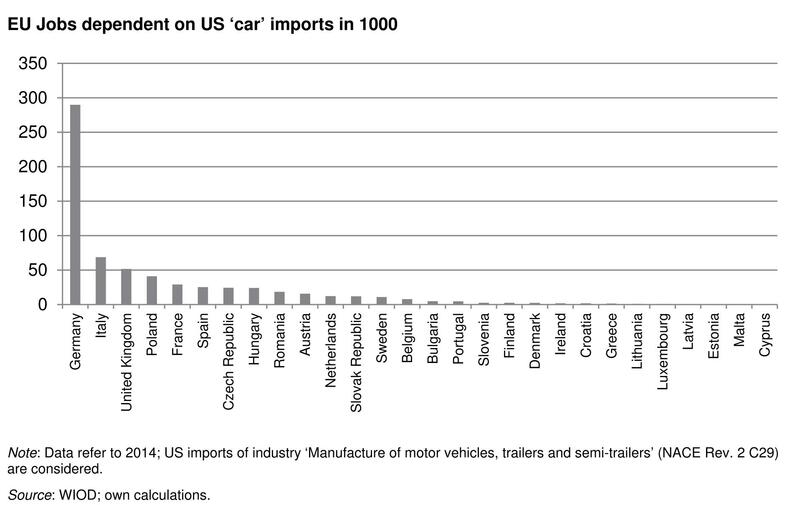 The exports of cars accounts for about 13% of total EU exports to US. However, the exposure is different across countries. The car-producing countries and those integrated in the supply chains could be hit significantly by a hike in US tariffs. A return to rules-based trade policies could hinder a spiral towards higher overall protectionism and uncertainty, although we are sceptical about this happening under the current US administration. EU Exports of transport equipment to the US account for 13% of the total, a relatively large share of overall exports to US. They account for about 10% of overall EU transport equipment exports in this industry, and about 1% of overall EU exports. European countries are exposed differently to US demand for cars. The threatened hike in US imports tariffs on cars to 25% (from now 2.5%) would potentially hit a few European countries in particular. Vehicles exports to the US account for 16% in total exports to US for Sweden, about 12 % for Italy and the UK, and almost 30% for Germany. In terms of total exports of vehicles this accounts for 10-16% of these countries. Other countries’ exports to the US could be affected intensively: The respective shares are 60% of the Slovak Republic, 28% for Hungary and 10% for Austria. In terms of overall exports these account for about 1-2%, though almost 3% for Germany. For these countries in general the share of exports in GDP is relatively high, such that these are particularly hit by such tariff hikes. 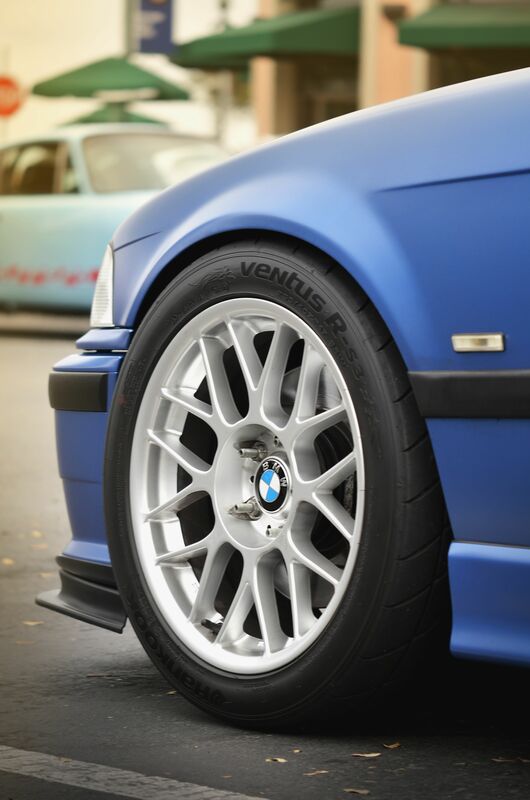 Automotive production is one of the industries with the largest cross-border production integration and therefore not only the car exporters themselves but also the upstream industries and countries are affected. 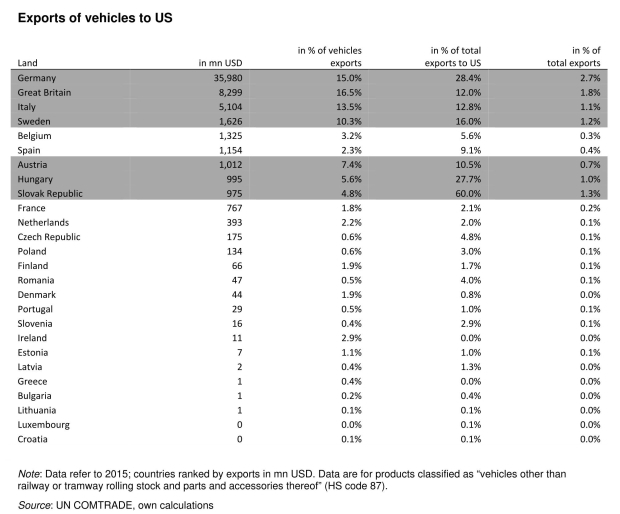 The figure below shows the directly and indirectly income created due to US car imports by country (as a share of its GDP). For some countries – Korea, Canada, Japan and Germany – this amounts to about 1% of GDP, for Mexico almost 3%. For another group of countries which are strongly integrated in the German value chains – Hungary, Slovak Republic, Czech Republic, Poland, Austria – one finds that the indirect value added due to production networks are particularly strong. 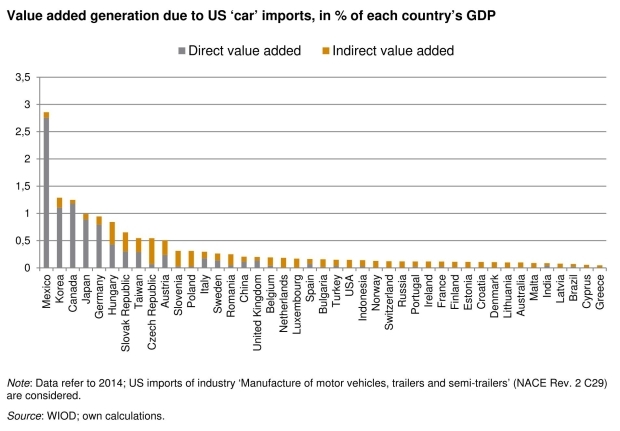 Consequently, the announced tariffs on US imports on cars of 25% would impact negatively on exports and therefore on income in all parts of the world, but particularly on countries specialised in the transport industry either by being exporters or integrated in the global production networks. 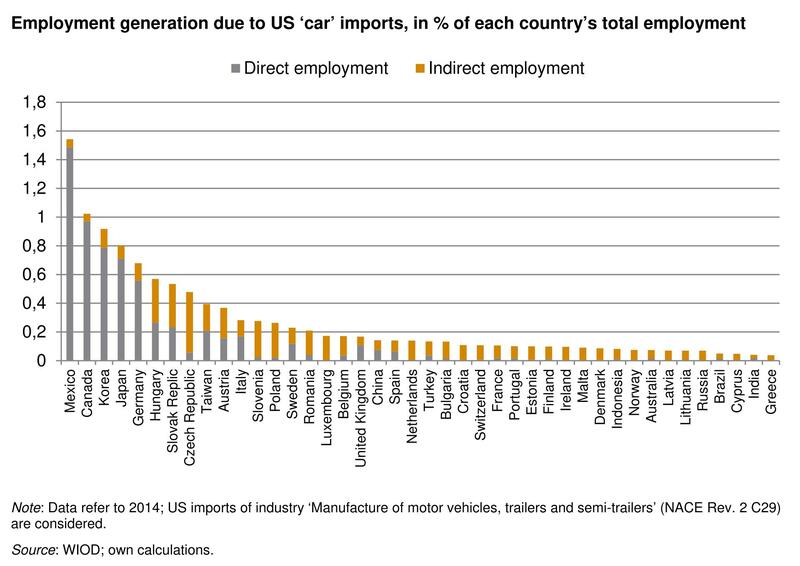 In the EU more than 600,000 jobs depend on exports to the US, which in total employment is a share of 0.3%. Again these numbers differ strongly across countries, and range from almost 300,000 in Germany to 70,000 in Italy, 50,000 in the UK and 40,000 in Poland. For the countries strongly integrated in the German supply chain the number of jobs is around 25,000 for Czech Republic and Hungary, about 16,000 in Austria and 12,000 in the Slovak Republic. The extent to which these jobs are in danger depends very much on how strong US imports react to the price hikes and the exporting firm’s pricing strategies, as well as other country’s reactions (e.g. China). The unilateral tariff hike of the US could result in a prisoners’ dilemma situation. An escalating trade conflict leading to a higher level of protectionism in the global economy would result in losses for all partners, particularly the car-producing countries. This is particularly the case as the US trade policy gamble spreads uncertainty and around the world and could lead to a higher level of protectionism, if not ruining the world trade system as it is. Fair trade negotiations and rules-based-trade as promoted by WTO would have the potential to benefit all partners. The Chinese announcements of tariff reductions and easing the access to foreign firms could be a signal for that.